Volunteering your time building in Asia is a wonderful way to interact with communities abroad, get your hands dirty and see physical results from your work. Building volunteers help local communities with much-needed building work and repairs that they would not otherwise have the time or resources to do. Projects Abroad Building volunteers help construct libraries and repair and decorate schools, day care centres and other community buildings that need maintenance. The Building programme is open to all volunteers, whether you are on a gap year, at university or wanting a career break. Building in Asia - What Is It Like? 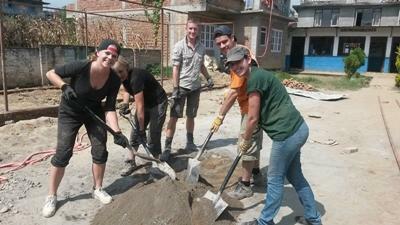 Building projects allow volunteers to make an immediate, tangible contribution to the people in your host community. No previous experience is required, as long as you are passionate about making a difference and willing to work hard! Whether you help repaint a school, fix a crooked door for a day care centre, or lay the foundation for a new house, you will be able to see exactly what you accomplish and the impact you have made. Volunteer on a Building project in the Philippines and help local builders to construct much-needed sanitation facilities in the San Remigio municipality.